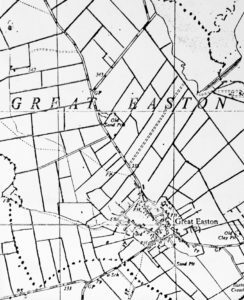 Great Easton is situated in South East Leicestershire within the Harborough District. The village has 278 residences and around 531 inhabitants. Each village entrance should be marked by rustic-style gates on either verge, linked up to the 30 limit. There will be new village signs and the whole village gateway will be tidied up. On the road, there will be “dragon’s teeth” similar to those already on Barnsdale, which will be supplemented by a “30” rounded and some white lines across the road. All this can be done for an outlay of around £1600.00, if local people are prepared to join in the installation of the gates. 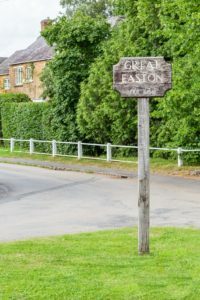 We are also looking in to a flashing speed sign for Caldecott Road, similar to that in use at Hallaton duck pond but this would , of course be more expensive. If anyone has any questions please email the Parish Council at admin@greateaston.org. This site satisfies the statutory requirement on the Parish Council to provide transparency through publication of its proceedings. Contact the Parish Council by emailing – clerk@greateastonparishcouncil.org or go to the Contact Us page.